A Personal Cyberinfrastructure (EDUCAUSE Review) | EDUCAUSE.edu. Personal learning environment and the learning of mathematics. Possibility or reality? I have participated in a conference organised in Belgrade by Singidunum University. They are oriented towards business and the conference mainly approached themes about the impact of the Internet on business activities in Serbia. They have plans to broaden their offer and include educational studies. So for this conference they invited speakers and papers that relate education and the Internet, which is my case. My interest lies in between these two areas. I am looking at how can the affordances of digital technologies be explored and exploited by teacher-students (prospective teachers) in the learning of mathematics. Is a personal learning environment an effective and powerful tool to stage-manage the learning/teaching experience of teacher-students and build experience in the field? If the hypothetical answer is yes, why is it so and how should this space be conceived? What are some features such a space should have? In the time I have been working in this -for now only theoretically prototype idea- I have changed the RME for just an E. It is now E–DynamicSpace (E stands for empty, as this space starts as an empty workbench for teacher-students which will be filled with their work, ideas, knowledge artefacts, tools and all what for them is needed to process and learn mathematics through its history and the ignitors for the work are teacher-student questions. So it starts as an empty place and it will end as the imagination and curiosity of each user will take them. The idea of developing personal learning environments brings me immediately to connect environment and space. An environment is a space, it is a space that can be infinite, or at least with no visible boundaries, such as a natural environment lets say a forest, where the sky could extend into infinite. Lefebvre (1991), argues that space is a social production. From natural spaces, considered as absolute spaces to more complex spaces whose significance is socially produced. The production of space throughout time is a three-part dialectic between everyday life and perception (and that is shaped by actual social values), the representation or theory of space, and the spatial imaginary of the time (Lefebvre, 1991). I advocate for a creative imaginary that belongs in words of Castoriadis (1975), to an open society. That needs an awakening of imagination and creativity. Seven decades ago, John Dewey stated that space has an impact on learning, and so did Vygotsky back in 1978, who conceived learning as a transaction between the person and his social environment. Therefore educational settings are better served by specificity than by serendipity. Few design questions have been raised about the learning behaviors that the space aims to encourage. Skepticism about design of spaces and the effect they have in students’ behaviours speaks for a deterministic view of the connection between design and behaviour (Bennett, 2006). The space is so relevant to learning that the evolution and development of the school building was the logical architectural response to changing educational theories. Other forces such as cost-generated construction techniques, health and environmental aspects were merely tools to reach the goals already established by educators and, by themselves had little or no impact on the layout and organisation of the learning spaces (Mohamed Ageli Hammad, 1984). Dewey argued that education is a social process, and consequently it requires a prior definition of the kind of society within which learning occurs. Tuned with his idea, and thinking that our actual educational system (blackboard knowledge and the imposing teacher) represent the quintessential learning space for the industrial era (taking into account some exceptions) we suggest to move towards an upcoming innovative culture and a learning intensive society (Miller et al., 2008), and think about what spaces and conditions students need to construct their knowledge while meaning-making, moving from a teacher centred approach to a student centred one. In the past, speaking of “learning space” was not common. The usual word used was “learning place” suggesting the image of a unique physical space called classroom, with its chairs and tables, notebooks and pencil. Although the classroom is still the core place to learn, there are several changes occurring and new opportunities flourishing. Adding new possibilities allowing us to use a broader term such as “learning space” (Brown and Lippincott, 2003, Trouche et al., 2012). As traditional classes are feed with technology they acquire new functionality, fostering new activities and new ways to learn, and to work. New formats are available, and new dimensions opens up: a vast array of tools available at no cost are at a distance of a click! The designed and structured surface of a picture 3. Mathematicians like to deal with abstract space, which contains no physical substance, can have an unlimited number of dimensions, and whose properties are determined by various postulates. as a shared space to build knowledge. Knowledge following this theory is acquired through individual experience, and on reflecting on the experience of others. In that sense, it has to be a safe place, where care, trust and, commitment are embraced. The process of transforming tacit knowledge, embedded in the space into explicit one occurs through sharing thoughts, experience, and, feelings. Kolb and Kolb (2005), created a definition of learning space supporting it with their experiential learning theory. They use the term “microsystem” to describe immediate settings, environments such as the classroom or an online course environment, and “mesosystem” referring to concurrent settings in the personal life of the student (e.g. the dorm, other courses, or the family), the exosystem to describe the formal and informal social structures that influences the person (e.g: school culture), and the macrosystem overarching values of the wider culture. According to these authors the learning space should be a space with place for action. There should be active expression and testing continuously involved in the learning process. is very relevant for this project, as a core idea underlying the design of the space. Malcon Brown (2005), in his chapter of Learning Spaces, defines the learning space as a space that encompass the full range of places where learning occurs, from classroom to chat rooms, from real to virtual; but in all cases a new space that do not need to have only one format. Tourche et al. (in press), debate about “learning space” and “teaching space”. Making the difference between the space where the students learn, and the “teaching space” where teachers arrange and orchestrate their learning. They are tuned with Brown’s (2005) idea that ICT enlarges the scope of the learning space, adding new dimensions to it. They combine the idea of mental space and the unlimited learning spaces generated by new technology. I add to this idea of teachers orchestrating their learning, that my proposal of a Rich Multimedia Empty DynamicSpace is an approach to learning where students can orchestrate their learning allowing them to organise, collect, curate, produce and, share what they need in order to learn. which is accompanied by the emergence of a new kind of mindset, which will be described in another posts. This idea refers to the advent of a new space, which they call “cyberspace”, that interacts with physical space. No one exclude the other and it is obvious that physical space cannot dismiss cyberspace. This cyberspace is an integral part of the spatiality of the Net Generation and both spaces co-exist. Therefore I start with a description of the learning space I intend to create for my study. The “learning space” will be a virtual personalised space –cyberspace- conceived as a dynamic rich multimedia environment, empty of content knowledge and full with multimedia tools. Aiming at working dynamically in the learning process, building the knowledge needed to understand the core ideas behind the subject. A process that occurs not only in the classroom but anywhere they choose to. Being a portable and ubiquitous space that they carry with them when/wherever they need to. An empty canvas, a designed and structured surface, where they can organise their space in highly personalised complex forms. Forms that allow them to: experiment; perform; probe; model; collaborate; show and share; create; and communicate. A place where they are also the “owners” of the knowledge they create and share. In brief, a personal dynamic virtual environment to design and create (in multimodal formats) mathematical knowledge, in the pursuit of understanding mathematical core ideas and deciding their learning pathway while they are producing their own ideas. Using the history of mathematics as a cultural context. Placing the students in the center of the space as signs makers, as designers of meaning, and of the meaning making process they are engaged with, conceiving pedagogy as a process of design (Jewitt, 2008). The task of the learners is solving problems through creating new artefacts (texts, designs, models, products or services among others), designing their learning trajectory, choosing among different modes of expression, and finding the one that fits with their way of understanding the world and consequently mathematics. 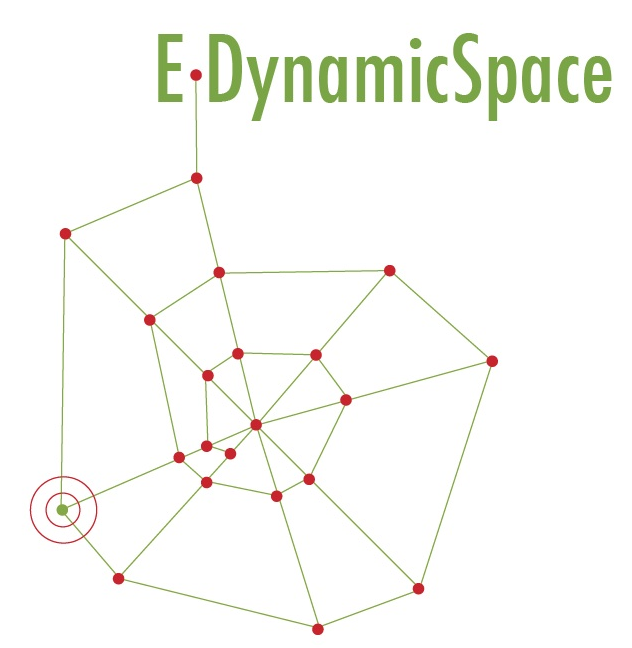 The next step is to generate a concept or maybe better, create categories that functions as descriptors of the RME-DynamicSpace. I took inspiration from a document that I came across in 2013 (mentioned above): School’s over: Learning Spaces in Europe in 2020: An imagining exercise on the future of learning (JRC and IPTS). I shared some of their vision and added some of my own to come with an initial set of 7 duplets -as I call them- that describe the learning approach I am aiming to create.